From the early explorations by British foresters and Indian botanists, research activities in KMTR have come a long way, with most large taxa - mammals and plants - documented and studied in some detail. ATREE’s present faculty began its activities in the KMTR region in late 1989, when affiliated with Pondicherry University. The uniqueness of this group’s ongoing research has been to document and understand change that is happening to natural ecosystems - which makes it different from the taxa-based studies that were prevalent earlier. Now with nearly two decades of presence in the area, research in the Agasthyamalai region evolved from a largely academic pursuit in the early days to more conservation and management driven in recent times which entails a very inter-disciplinary approach spanning across several fields including social sciences. We hope all this would help understand the landscape better and become a model for research and conservation in and around protected areas. Currently the entire research and conservation program in Agasthyamalai, KMTR in particular, is being coordinated by the Agasthyamalai Community based Conservation Centre (ACCC), housed in a rented accommodation at Singampatti village near Kallidaikurichi, in Tirunelveli Dist. The present information on bioresources is mostly qualitative and not easily accessible for those who manage and use these resources. 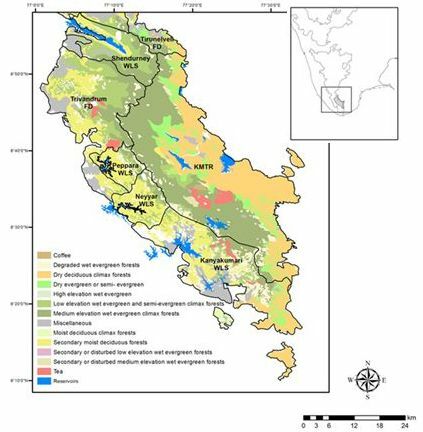 As a sub-set of a larger multi-institutional collaborative project to ATREE was involved in sampling along the eastern slopes of southern Western Ghats. Understanding changes in natural systems is usually a long term process that requires careful selection of the critical parameters that have to be monitored. In early 1990, following the global trend to understand community ecology - more so in Asian tropics, a series of monitoring programmes evolved building on some initial studies at Kakachi in the wet forest of KMTR. Part of this - phenology of trees, vegetation dynamics, pollinator and frugivore abundances and weather parameters were monitored since then. These monitoring studies have shown that inter year variations are strong and often unpredictable. Pollinator movements are predictable in terms of its occurrence but not in terms of its variability. We had one of the best years for frugivorous bats in 1994 when Palaquiumellipticum, an evergreen forest species produced a large number of fruits and fruit bats congregated in very large numbers in the Kalakad forest. The 270 and more villages surrounding KMTR were dependent on the forests for fuelwood and grazing. We have a monthly monitoring programme on fuelwood use and grazing pressure on forests by Singampatti and surrounding villages using the footpath method. Fuelwood use from forests appears to have decreased in the last 7 years of monitoring. Grazing inside the forest does persist but at a much lower level than before. Most interaction studies in the wet forests have been achieved by accessing the canopy. Some of the pioneering studies on forest canopies in India have been done here. Indigenous access techniques such as ladders and ladder bridges have been locally designed to facilitate such research. Canopy research at the site has also advanced from ladder access to single rope technique, and from processes-based study to applying assembly rules and niche theory to explain the canopy communities. Canopy research and long term monitoring has been, in some sense, a flagship programme of the KMTR research agenda. Canopy work in KMTR has now made possible for ATREE to host the fifth international conference on canopies in India and that would hopefully lead to setting up a ‘National Canopy Programme’. The forests of KMTR have been exploited for centuries by various stakeholders. The scars of these are still visible, even several decades after cessation of activities like logging. Large areas now inside the reserve have been planted with eucalyptus, cardamom, teak, tea and other commercial crops. These have either been abandoned or likely to be so in the future. How do native species found in the forest colonize these abandoned areas and what management protocols need to be followed to facilitate native species colonization is one of the key areas of research pursued in the landscape. The Agasthyamalai Mountains is the source of many perennial rivers like Tambaraparni. Through a network of reservoirs, canals, tanks, the rivers are both a source of livelihood for the farming community and an important area for local biodiversity. Wetlands around KMTR and in other places are under threat; they are encroached, polluted, silted and overgrown. We are surveying wetlands within 5 km from the reserve boundary and recording the plant and bird species in them to identify key wetlands for long term conservation. We are also exploring how these wetlands can be conserved using local communities and what policy amendments are needed for their conservation. The interaction between forest and agricultural area around it provides opportunities to explore the services of the forests to the agricultural landscape. The periphery of KMTR provides suitable habitats for rodent eating owls that forage in the adjoining agricultural areas. What ecological services the owls provide to the farmers and what in turn can farmers do to sustain such services is the focus of the research on rodent eating large owls. The ACCC outreach activities are very diverse and all-encompassing. They include providing multi-purpose plant species for meeting the diverse needs of local communities, building awareness and capacitiesof NGOs, Panchayats, other institutions, individuals and other stakeholders on environmental conservation, using art as a medium to take conservation to a larger audience. The environmental education programme, now in its sixth year (2010), has concentrated around Singampatti villages but is expanding to areas further north near the proposed community reserve of Vaagaikulum. Building awareness about the richness of life around us in the local context requires material in local languages, conveying information about the local flora and fauna. The available field guides are mostly in English and filled with jargon that is often intimidating for a lay person. To address this issue, ATREE has come out with a first-of-its-kind bi-lingual; multi-taxa nature guide to KMTR. The guide, authored by T. Ganesh, R. Ganesan, SoubadraDevy and JahnaviPai, aims at disseminating basic information about common and unique plants and animals of the region among school children and other individuals interested in knowing more about the reserve. The ACCC team brings out a newsletter ‘Agasthya’ once in four months. This highlights the significant work in the Agasthyamalai region by ATREE staff in a reader-friendly language. We are planning to bring out Agasthya in Tamil and have people from the landscape contribute to it. We are also in the process of developing a comprehensive education manual for wetlands, which would encourage students to discover life in the wetlands around their villages and instruct them in steps they can take to conserve it. ATREE’s Agasthyamalai Community Conservation Centre (ACCC), in association with Pearl City Nature Society (PCNS), Thoothukudi, and Nellai Nature Club (NNC), Tirunelveli, are conducting the 7th edition of Tamirabharani Waterbird Count (TWC) on 4 February 2017. The Tamirabharani wetlands support over 90 species of waterbirds, most of which are migratory species. Interested persons can take part in the survey and compilation of information about the winged visitors they could see during the count. Please contact: Mr M Mathivanan, Coordinator, ACCC (email: mathi@atree.org, mobile: 94880 63750).